Episode 7: Mobile Analytics | Beyond Web Analytics! This episode we talk with the newest member of Semphonic, Greg Dowling, as we explore the intricacies of mobile analytics. From the current state of the mobile analytic space to what the future may hold. Greg shares his insight on steps to take to justify a mobile strategy, steps to organize and implement that strategy, and what metrics to look for. An expert in mobile measurement and enterprise analytics with fifteen years in the industry, Greg Dowling heads up Semphonic’s New York office and leads their mobile strategy and measurement practice. Prior to Semphonic, Greg was Head of Analysis for Nokia’s Services Intelligence & Analytics organization responsible for analysis of all consumer data within Services domains of Music, Media, Messaging, Games, and Social Location. Prior to joining Nokia, Greg was Vice President of Strategy & Analysis for Digitas where he led their Web analytics capability supporting clients such as Delta, Kraft, Heineken, and Time Warner Cable. Prior to joining Digitas, Greg was a senior analyst with JupiterResearch focused on the best practices for Web site operations, from staffing and budgeting to vendor selection. His areas of specialization included Web site analytics, site search, content management and usability. This article was posted in Podcasts, Social Media, Web Analytics and tagged Mobile Analytics, Podcast, Web Analytics. Bookmark the permalink. Follow comments with the RSS feed for this post.Post a Comment or leave a trackback: Trackback URL. Thanks for the Bango mention Greg. You are correct that user ID is the crucial aspect in accurate mobile measurement, without that the remaining metrics fall down. Cookies, IP addresses and subscriber ID’s (MSISDN, Sub Number etc) all have their problems and should not be relied on alone. Cookies are simply unreliable on mobile while a mobile subscriber ID / MSISDN is great for recording visitors on the carrier network but does not cope with WiFi. Which is crucial given the frequency at which consumers switch network connections on their smartphones these days. The Bango platform solves this by placing a layer above all these methods – which provides a consistent visitor ID for tracking while also leveraging all the best physical IDs below. It’s your shared key across all platforms, sessions, connections, devices etc you mentioned. This is one way in which we deliver our 8x accuracy, our industry partnerships is another. Best recommendation to anyone is to try us out at http://bango.com/analytics. Thank you for the PercentMobile mention. This is a great podcast and I have listened to every episode so far. We use Omniture for our website analytics and we have been trying to figure out a way to filter out our employee mobile phone numbers from the mobile phone stats. It seemed that a solution exists which was lightly mentioned in the podcast. Would you mind providing me more details as to how this can be done (possibly within our existing Vista rule)? 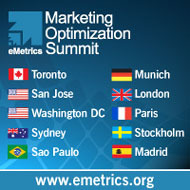 I am not sure of the particulars on how to do this, but speak to Ed Hewitt at Omniture. He will know how.